Yes, this post is coming a little late today. But better late than never, right?! 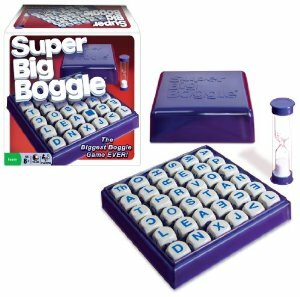 So for all you Boggle players out there, what's great about Super Big Boggle ? Well, it contains 36 letter cubes for one thing. There are two special cubes: one which contains six double-letter combinations (e.g, "th" and "qu") and a second cube which includes "blanks" which create spaces between letters, eliminating hidden word possibilities. In all other respects, I-who-am-not-an-avid-Boggle-player assume the set-up is roughly the same. Once the cubes have settled into the grid, you start the sand timer running. Each player has four minutes to find words consisting of four letters or more. When you find a word, you write it down. Players receive points for the number of letters per word and the player with the highest score wins. Roughly explained, this is how you play the game. I asked Bookworm1 after we had played three times (per his request) if he much liked the game. His response? : "Yes, can we play it again?!" I took that for a yes. And because I am his mother and I love him I said yes and we played again. Irony for me is that I have given birth to a chess player who likes word games. (My world! My world!) Heh. Many thanks to Winning Moves for sending a copy of the above game for us to check out and share our opinion of. Our opinion is that this is a fun game. Also, that it is much more exciting for a young kid/student to feel like they are playing a game that is designed for adults rather than a cartoonish spelling game that doesn't stretch their minds very much. Children want to be challenged and Super Big Boggle offered a challenge to my youngster. Thanks for that! I love word games. Thankfully my oldest does, too - we play three different kinds long distance via iPhone. This sounds like it would be more fun and more challenging that regular Boggle. I love how you are leaving your comfort zone for you family!! We should try to let Bookworm 1 and my son play this together sometime this summer. My son has liked Scrabble for awhile. So, I was with you about not liking board games, but there is one exception. It's word games. Of course, I rarely (I'd say never, but that would be bragging) lose at word games, so I'm sure that increases my ardor. But seriously, I do like them, and I am actually surprised you don't. I learned something today. What a nice sacrifice you made.